You already know that, when painting stairs, you should start at the top and work your way to the bottom. That's easy to figure out, basic common sense. But some other questions you may not have considered. 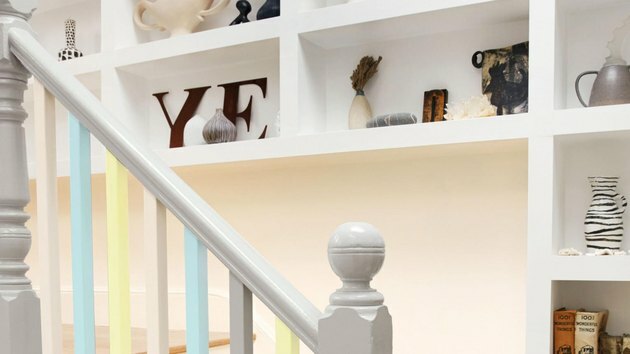 Should you paint the stairs or stain them? What kind of paint should you use? What's the best way to apply the paint? If the stairs are already painted, is it necessary to strip the old paint? And finally, what's the best color and style to complement your home's décor? Painted stairs can produce many different design effects. A stairway consists of four main parts, and you should handle each part separately. The treads are the part of the stairway that you walk on, and they call for durable, slip-resistant paint. The risers— the vertical sections between treads—don't suffer as much abuse, so you can use less durable paint, which gives you more color choices. That's also true for the stringers, which form the sides of the staircase. Finally, you might also want to paint the railing the same or a different color as the stringers. Whether or not you need to strip the existing finish, stair painting involves a fair amount of prep work. In fact, many pros maintain that preparation is 90 percent of a quality job. So get out your palm sander, your paintbrush and your respirator, and get ready to flex your creative muscles by transforming one of the most visible features in your home. 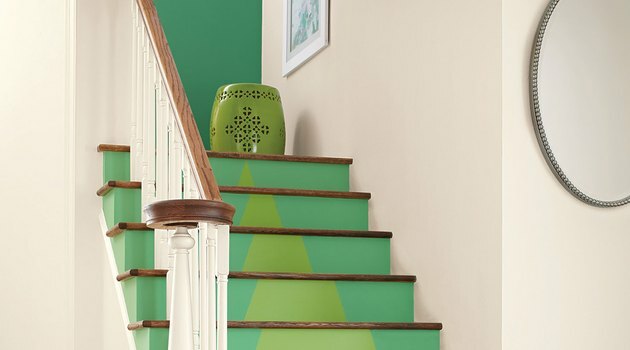 Painting a staircase can be a design adventure. No rule says you have to use different paint colors for the treads and risers, but there is a good argument in favor of it, especially if you paint the treads a dark color. In dim light, a contrasting color on the risers makes the treads easier to see, and that reduces the risk of a misstep. A monochrome color scheme has its own charms, though, especially if you choose a light color or the stairway is well lit. Color aside, you need a durable finish for the treads, or you'll have to repaint in short order. Most painters recommend porch and floor enamel. This finish tends to be glossy because it contains more binders than matte paint, and it's the binders that provide the wear resistance. 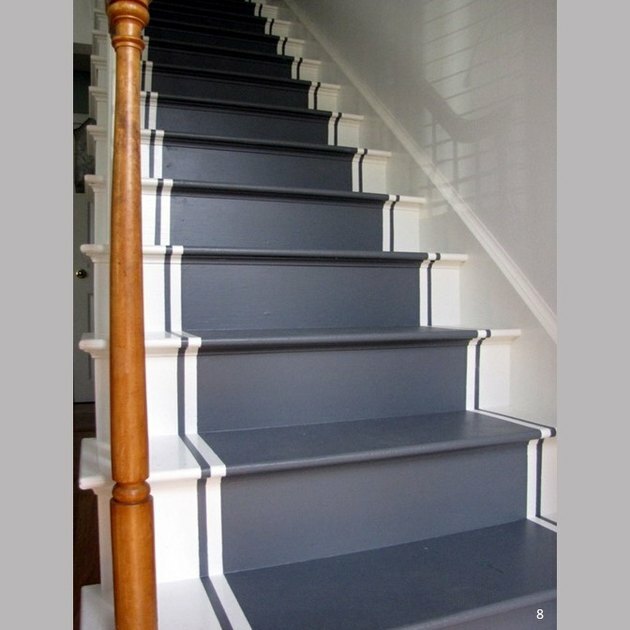 Interior or exterior trim enamel is sufficiently durable for other parts of the staircase. Don't forget to apply a primer. It's a requirement when you're painting over bare wood, and it also helps paint to adhere better to old varnish and existing paint. Use a high-solids latex- or shellac-based primer. If you want a color outside the palette of the porch and floor enamels available at your paint store, consider applying regular enamel and coating it with a durable clear floor finish. Top-coating with a flat clear finish is also a good way to the cut sheen of glossy enamel without sacrificing durability. Prepping stairs for painting can be messy, but don't get discouraged. You can strip stairs with any heavy-duty chemical stripper that works for furniture, and the process is as messy as you might expect it to be. As an alternative to chemicals, you might consider renting or purchasing an infrared stripper, which softens the paint with heat so you can scrape it off. Like chemical stripping, this method is safe for lead-based paint. Got a build-up of multiple coats on an old wooden or concrete staircase? Consider a lye-based stripper, which usually comes on pre-treated strips. Apply the strips according to the instructions, let the stripper sit for 24 hours, and the paint will come off as easily as plastic packaging. Don't forget to neutralize the stripper per the instructions before painting. Once you're down to the bare wood, sand the stairs to remove flecks of paint and to smooth out rough areas. You might be tempted to use a floor sander or belt sander for this, but don't—you won't have enough control. Stick to a palm sander and 80-grit or finer paper. Fill any holes you can't sand flat, using epoxy filler. When prepping concrete stairs, use concrete patch to fill holes and be sure to give the product at least two days to dry before painting. As a rule of thumb, the railing comes before the treads and risers. You should start painting at the top of the staircase, and you should also begin with the railing so you don't have to worry about drips and splatters marring the finish on the treads and risers. If you protect the treads with cardboard during this part of the project, you won't have to worry about cleaning them. When it comes to the treads and risers, the question of which comes first may seem like the chicken and the egg, but it's pretty straightforward. If you're staining the treads, it's best to do them before the risers, because the finish protects the wood from paint splatters. If you're painting the treads and risers different colors, you'll still find it easier to paint the treads first because they are easier to cover with masking tape once the paint dries. 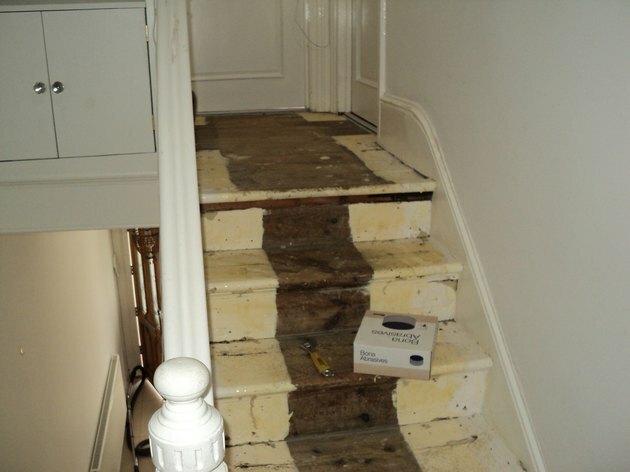 Masking tape also comes in handy if you want to paint stripes on your stairs or create other design effects. Stripes and effects are easier to produce if you apply a base color to the entire surface first, use tape designed for painting. It's treated with a water-soluble polymer that gels when it contacts paint, dramatically reducing seepage and producing crisp lines. This is the best tape to use when paint treads and risers different colors, where masking is required. One more thing to consider when planning your painting job is which application method to use. Spraying is an option if you're applying a single color, but remember that the paint you use for the treads is thick and durable, and is best applied with a brush. It's true that a foam brush won't leave stroke lines, but foam brushes tend to be harder to control. It's best to follow the method used by most pros: Use a bristle brush that has a clean, tapered edge to paint stairs and railings.